It's the perfect time of year for comfort food. When it's cold and gray outside, it's nice to warm up with a plate or bowl of hot food that brings back memories of home and family. You know what's even better than warming up with comfort food? 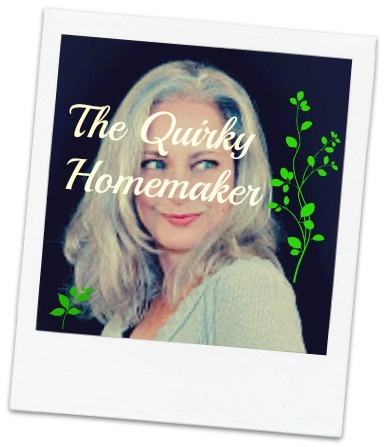 Not having to create it from scratch by yourself (although I do love cooking from scratch!). Sometimes I get busy though, and don't feel like taking the time to make something from scratch. Although I love cooking, it can be a time-consuming task! If you're a busy parent~~aren't we all?? 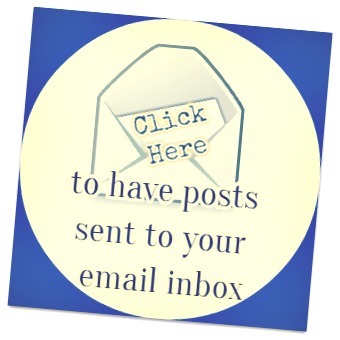 ?~~you can have a healthy, reasonably priced comfort food meal on the table in 45 minutes. And the hardest thing you have to do is take it out of the box! Blake's has done the preparing for you. All YOU have to do is throw it in the oven! Then you can spend that 45 minutes that your pot pie(s) are cooking to relax and catch up with your family. I was able to find my pot pies at Walmart and Target. They are also available at Whole Foods Market, Meijer, Publix, Sprouts, Kroger, The Fresh Market, Natural Grocers, Wegmans, Albertsons, Safeway, Raley's, Hannaford, Shaw's, Market Basket & many natural food stores and Co-ops. You can check out the store locator at the Blake's website to find a store near you. 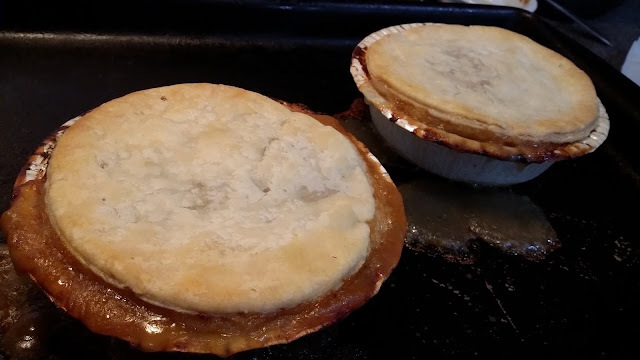 I found my pot pies in the freezer sections with the other natural and organic foods. I paid between $3 - $3.99 for mine. 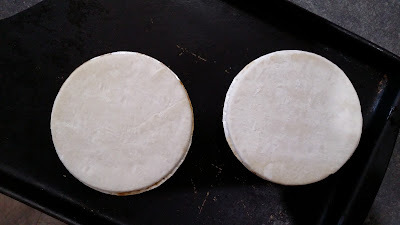 The pot pies that they wanted me to try were the Turkey Pot Pie and the Beef Pot Pie. 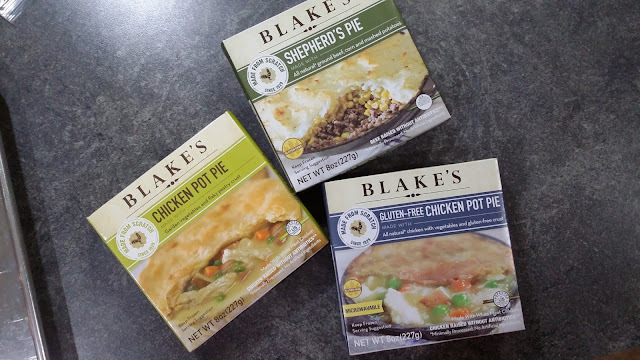 Blake's also has Chicken Pot Pies, Gluten-Free Chicken Pot pies and Shepherd's Pie. They are a great 8 oz. individual size. 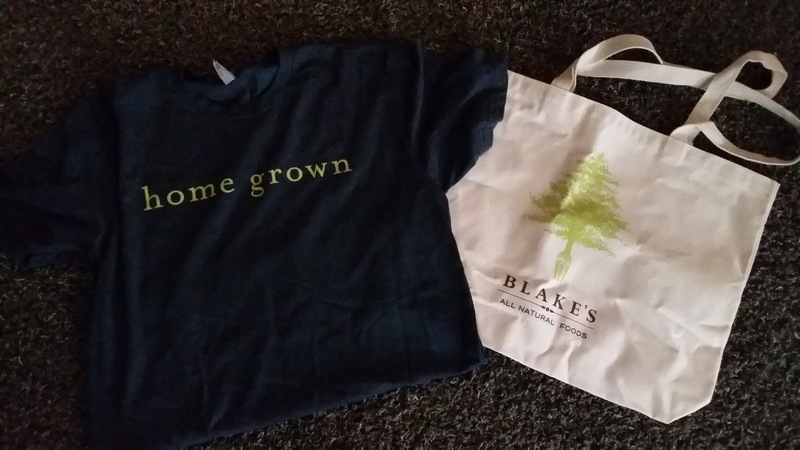 In addition to pot pies, Blake's also carries Chicken & Dumplings, Lasagna Bake Bolognese, Chicken Marsala with Pasta, Mac & Cheese, Chicken Parmesan with Pasta & many more. If you need Gluten-free, Blake's also has a gluten-free and dairy-free Chicken Pot Pie, a dairy-free Macaroni & Beef, a gluten-free Shepherd's Pie and a Hearty Beef Stew, which is gluten-free, dairy-free, soy-free and egg-free. 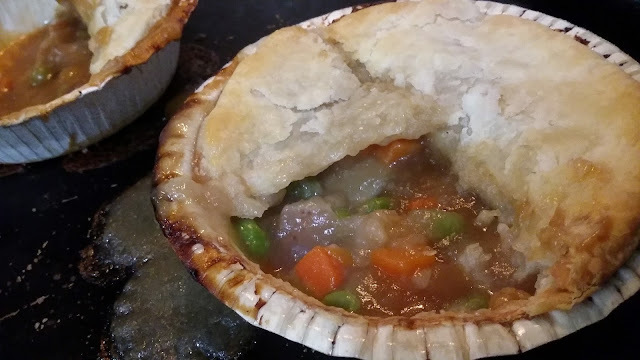 For generations, the Blake family has been creating pot pies by cutting the veggies by hand and creating gravy from scratch. 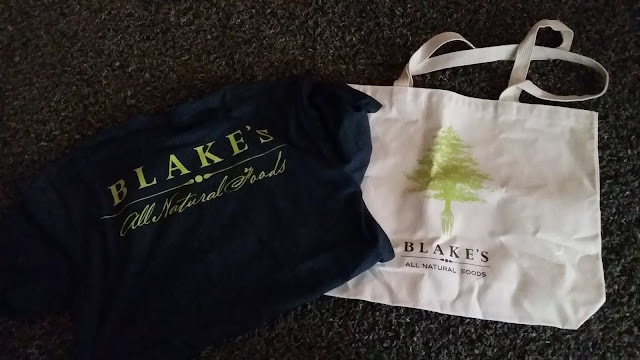 The Blake family started out as turkey farmers back in the 1920's. Clara Blake raised turkeys and cooked from scratch. Her recipes have been passed down through the generations and are being used to create the from-scratch meals that they sell now. The Blake family has always believed in raising free-range turkeys and putting the healthiest ingredients into their recipes as they can. The goal of the Blake family has always been to put as many healthy meals on the table for as many folks as possible. They began by creating meals just for the New England area. In 2006, Amy & Chris, the great grand-children of Clara Blake, decided that there must be even more families out there who were concerned about eating healthy and being able to get meals on the table in a convenient way. At that point the company expanded, both in territory and in menu items. We LOVED the pot pies that we were able to try. I tried the Turkey and Beef pot pies with a friend and our kids. The crust came out of the oven so flaky and browned. 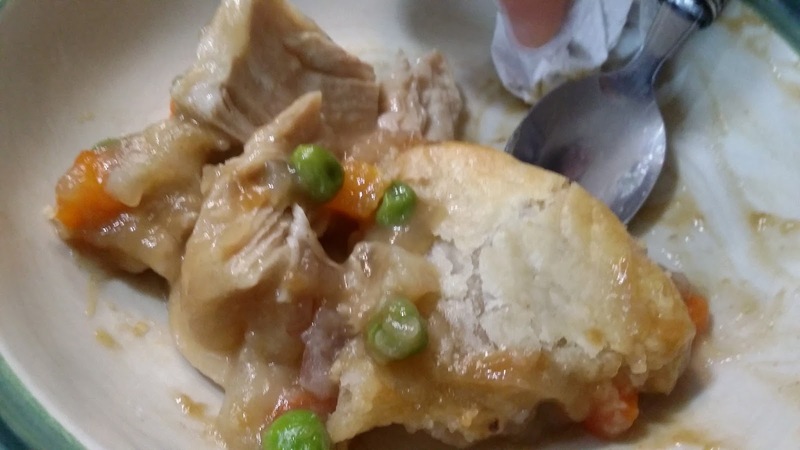 When you dig into the pot pie with your fork, you can hear the crunchy, flakiness of the crust. See those chunks of hand-pulled chicken??? Yum! The Beef pot pie had a secret herb in it that made it even tastier. We're thinking it might have been Thyme, but we aren't positive. All we know is that it tasted gOO-oo-OO-d! I love the convenient size and that they are individual pot pies so that each person can choose their own type if they'd like. The price makes it more affordable than going out to eat. A family of 4 can each have their own, individual pot pie for a total of around $16 for the family. Mine would have actually been cheaper since I got some of them on sale for $3. 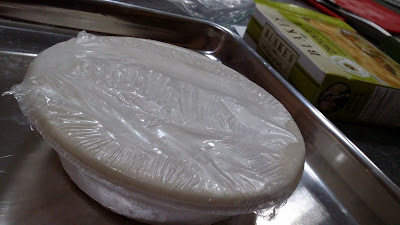 They are super easy to make. . . .
Take them out of the freezer. Place them on a cookie sheet, bar pan or sheet pan and cook at the designated temperature for the designated time. My hubby said, "Really good, honey," to which I replied, "All I had to do was put it in the oven! SO. Easy." My friend said, "It has a lot of flavor. Sometimes when you think about pot pies, you think it's going to be bland. But these definitely were not." We don't usually eat pot pies in our house because my hubby had never been a big fan, so I just never bought them. 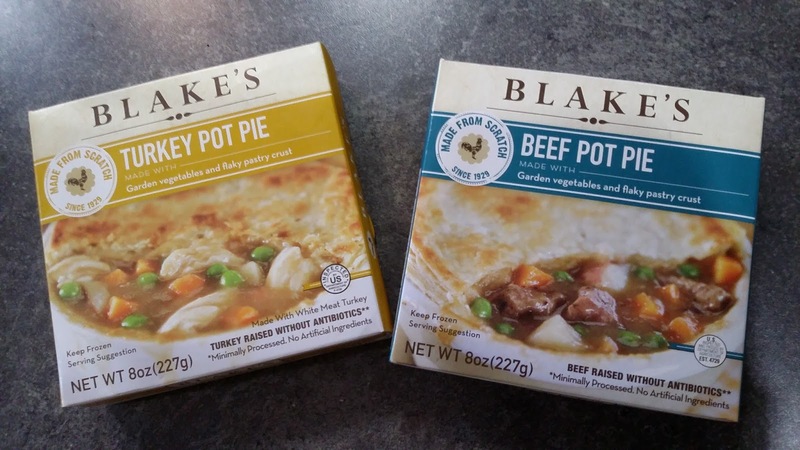 These Blake's pot pies have changed our minds! Even the kids loved them. They gobbled them right up, hand-cut vegetables and all. It's a meal you can feel good about serving your family. The pot pies are still to this day made in small batches by real people. The chicken, turkey and beef are always hormone-free and antibiotic-free. The Turkey pot pie and Beef pot pie are also dairy-free and soy-free. As with all of the Blake's meals, the pot pies don't contain any artificial colors, flavors or preservatives. 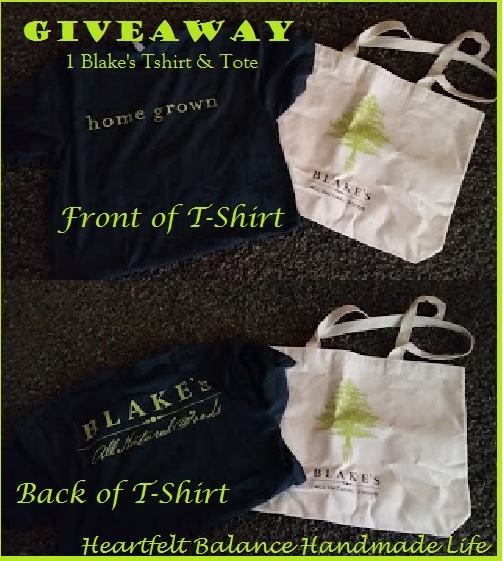 Momsmeet and Blake's have offered to let us host a giveaway for a Blake's Tshirt and Tote Bag. The tote bag is roomy and heavy duty canvas. The tshirt is a 60/40 cotton blend. Giveaway begins December 9, 2016 and will end on January 4, 2017. Let us get through the holidays!!! Contest is open to US residents only. You can enter via the Giveaway Tools widget below. Thanks and Good Luck! I love chicken pot pies so that would be what I would first try. The gluten-free and dairy-free Chicken Pot Pie. I like those t-shirts too. I would like to try the beef pot pie the most. I WOULD LOVE TO TRY THE BEEF POT PIE.